Norgau, a Russian company that develops and supplies industrial tools and equipment, opened a lab at the Skolkovo Technopark on Thursday that will both conduct R&D and offer services to Skolkovo resident startups and external companies alike. Norgau Labs CEO Valery Kostyuchenko (centre) shows Skolkovo energy cluster head Oleg Dubnov (left) around the lab. Photo: Sk.ru. The new Norgau lab specializes in metrology: the science of measurement. Its machines are able to measure the dimensions of industrial equipment and parts with very high accuracy to check whether they conform to the required shape, size and standards. 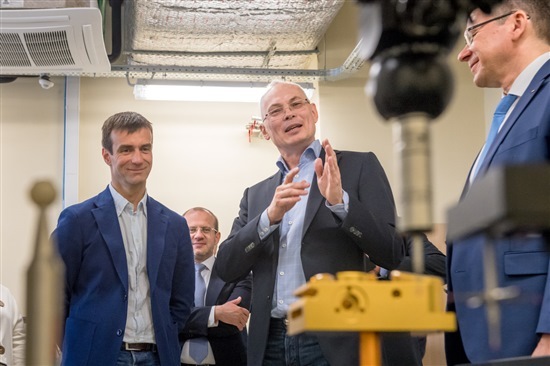 The aim is to eliminate elements of human error in the cutting and measuring of machine tools and equipment, said Valery Kostyuchenko, CEO of Norgau Labs and the majority owner of Norgau, who showed Oleg Dubnov, head of Skolkovo’s energy cluster, around the lab ahead of its official opening. The lab is equipped with vision-measuring devices for measuring lines and angles, as well as coordinate-measuring machines (CMMs) that measure the geometrical aspects of an item. The devices are made not only by Norgau, but by foreign companies including Japan’s Mitutoyo Corporation and U.K.’s Renishaw. “Norgau Labs is the only Russian company currently developing and manufacturing domestic metrological equipment, and as a Skolkovo shared resource centre, this equipment – both Russian and foreign-made – is now available to Skolkovo resident companies and partners,” said Ksenia Poveshchenko, senior manager for work with key partners within the Skolkovo’s energy-efficient technologies cluster, which signed a partnership agreement with Norgau on Thursday. “For machine-building and industrial enterprises, this equipment is essential both for designing ready products and for creating the means of their production,” she said. The devices in the lab are able to measure the dimensions of industrial equipment and parts with very high accuracy to check whether they conform to the required shape, size and standards. Photo: Sk.ru. As a Skolkovo partner, Norgau will have access to the innovative systems and products being developed by Skolkovo startups, and will also be able to use the research potential of the Skolkovo Institute of Science and Technology (Skoltech), a graduate research university established in cooperation with the Massachusetts Institute of Technology (MIT). Under the partnership agreement, Norgau will work on creating the first Russian machines and software for measuring systems. “Unfortunately, after the collapse of the Soviet Union this industry was one of the first to suffer, and right now most of the equipment and software used in factories in this field is foreign-made,” said Poveshchenko. 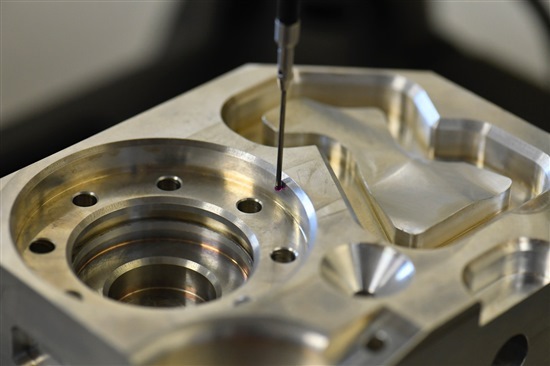 At the same time, it is estimated that every medium-sized Russian machine-building enterprise workshop requires at least one coordinate-measuring machine, she said. “Taking into account that the process of digitalization is developing inexorably, the metrology market in Russia is beginning to double every year. We hope that with support from Skolkovo, our ambitious hi-tech partner Norgau will soon be able to further develop this field in Russia and enter the rankings of the world’s best manufacturers,” said Poveshchenko. Norgau has 30 offices across Russia, as well as daughter companies in Singapore, Belarus and Kazakhstan. It already works with major international companies including Boeing, Gazprom and Pirelli.